St. Thomas averages 210-215 students. 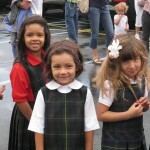 We offer one class per grade (Pre-K – 8). Our teachers have the opportunity to get to know each student and to make everyone feel important. The St. Thomas Aquinas community is our biggest strength. We celebrate our diverse backgrounds, including socioeconomic, religious and national origin as well as non-traditional family structures.